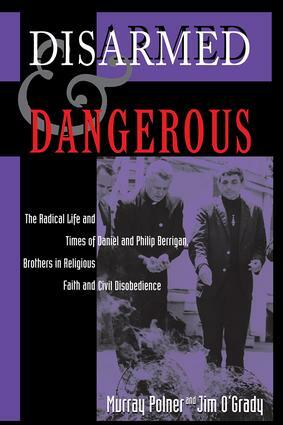 What transformed Daniel and Philip Berrigan from conventional Roman Catholic priests into ?holy outlaws? ?for a time the two most wanted men of J. Edgar Hoover's FBI? And how did they evolve from their traditionally pious, second-generation immigrant beginnings to become the most famous (some would say notorious) religious rebels of their day?Disarmed and Dangerous, the first full-length unauthorized biography of the Berrigans, answers these questions with an incisive and illuminating account of their rise to prominence as civil rights and antiwar activists. It also traces the brothers' careers as constant thorns in the side of church authority as well as their leadership of the ongoing Plowshares movement?a highly controversial campaign of civil disobedience against the contemporary arms trade and nuclear weapons.Murray Polner and Jim O'Grady plumb the Berrigans' contradictions: among them, Philip's secret marriage, while he was still a Josephite priest, to Elizabeth McAlister, then a Catholic nun, which led to their dismissals by their respective religious orders and Philip's excommunication from the church; and Daniel's speech faulting Israel's treatment of Palestinians, and the resulting criticism loosed upon him from pro-Israeli Americans and many of his allies on the left.Disarmed and Dangerous is a fascinating study of brothers linked by faith and the dreams of peace and social justice in a century bloodied by war, mass murders, and weapons of immense destructive power. It is, above all, an original contribution to modern American history that is sure to be widely read and discussed.